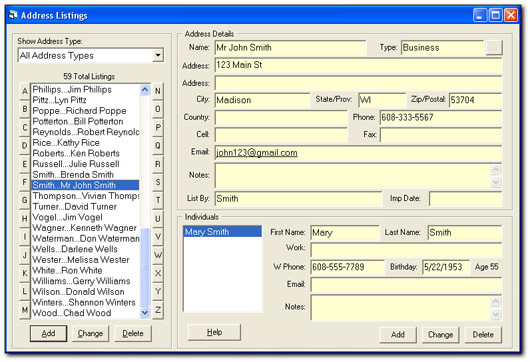 The StatTrak toolbar lets you select the Address Report, Phone Report, Detail Report (D), Custom Report (C), Birthday Report, print addresses on labels and envelopes, Search on address entries, print reports, format reports and launch the StatTrak Address Manager Help. On the Address Listings screen all of your address entries are shown in an alphabetized list on the left. Click on an entry and all the details are shown of the right. Any individuals for that entry are also listed. You can add any number of address entries. 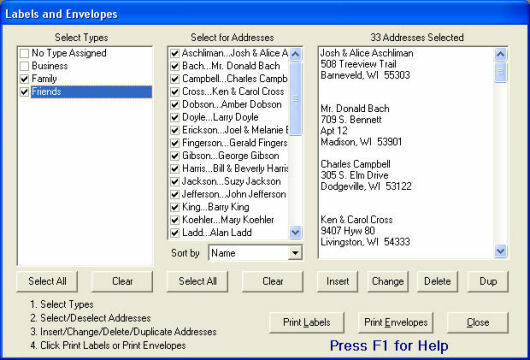 On the Labels and Envelopes screen you can select which addresses you'd like to print by choosing address types (family, friends, etc.). 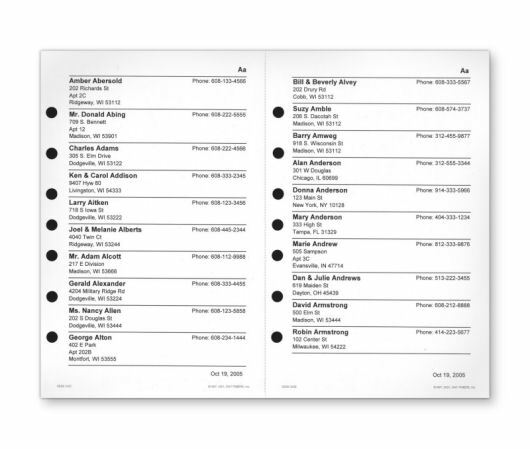 You can remove individual addresses from the print list by unchecking them. 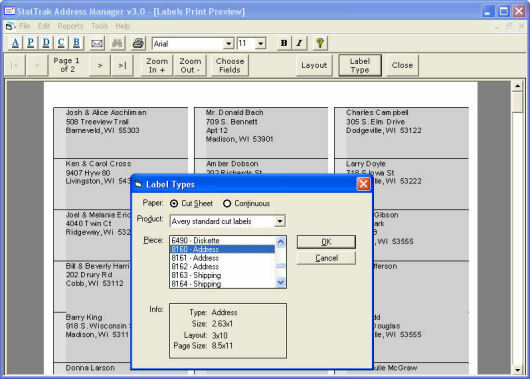 Then click Print Labels or Print Envelopes to display the print preview screen. On the Print Preview screen you can preview the labels you've selected to print. To change the label size click Label Type. On the Label Type screen you can choose which Avery label size you need. Your addresses are automatically aligned. Just click on print. 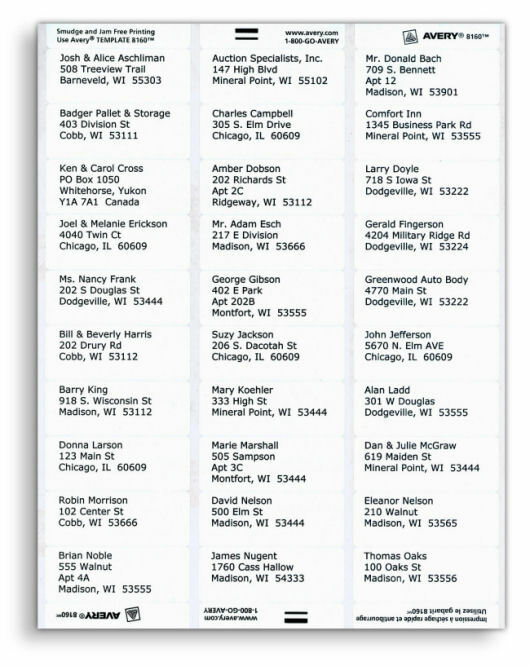 Here's an example of addresses printed from Address Manager on Avery 8160 label sheet. 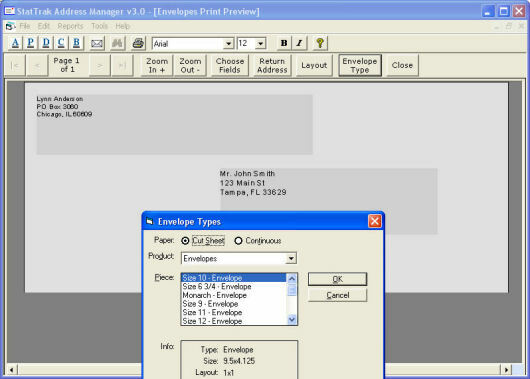 On the Print Preview screen you can preview the envelopes you've selected to print. To change the envelope size click Envelope Type. On the Envelope Type screen you can choose which envelope size you need. Your addresses are automatically aligned. Just click on print. Here's an example of an address printed from Address Manager directly on an envelope. Address Manager prints the return address too. You just supply the stamp! The Address Report shows the name, address and phone number for each entry. Click Select to change the report title and to choose which address types to display (e.g., only show family). Names are listed alphabetically down each column. You can change the report to have 1, 2, or 3 columns. 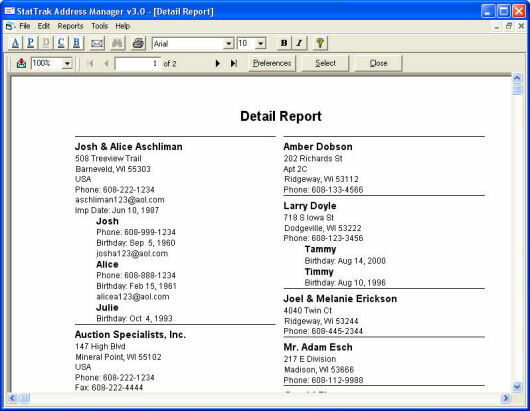 Click Preferences to print a report for your daily planner. Here is an example of the Address Report printed on planner paper. You can buy special planner paper that fits in your computer printer from us for planner size 5.5 x 8.5 and portable size 3.75 x 6.75. 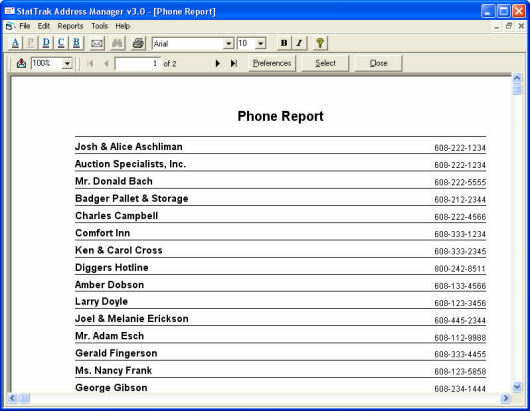 The Phone Report shows the name, and phone number for each entry. Click Select to change the report title and to choose which address types to display (e.g., only show family). Names are listed alphabetically down each column. You can change the report to have 1, 2, or 3 columns. The Detail Report shows the all the information you've entered for each entry. Individuals within a household are also included as well as email, and notes. Click Select to change the report title and to choose which address types to display (e.g., only show family). Names are listed alphabetically down each column. You can change the report to have 1, 2, or 3 columns. The Custom Report limits the fields shown to only those you've selected. Click Customize to check the fields you'd like to display on the report. Click Select to change the report title and to choose which address types to display (e.g., only show family). Names are listed alphabetically down each column. You can change the report to have 1, 2, or 3 columns. 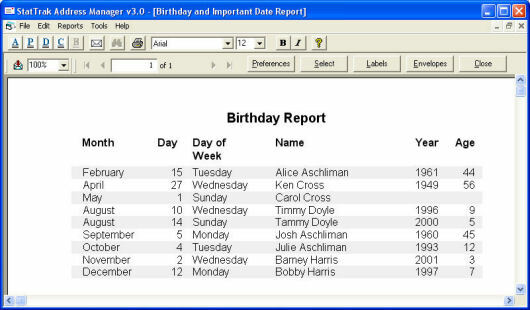 The Birthday Report shows all birthdays you've entered allowing you to keep tabs on upcoming birthdays. Showing Day of Week and Age are optional. Note, year is not required when entering a birthday. 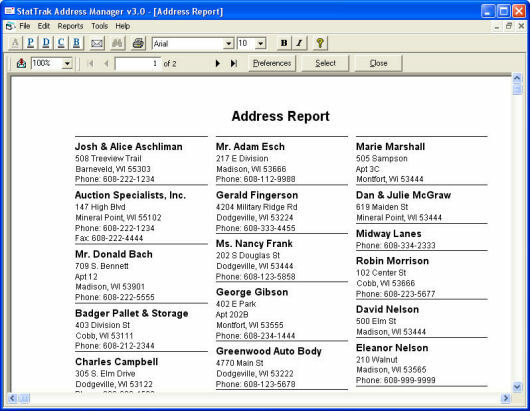 Click on Labels or Envelopes to create address labels or envelopes for all individuals displayed on the birthday report.